Results obtained by measuring fluctuations of the number of neutral pions in the SERP-E-190 Experiment (Thermalization Project) upon irradiating a liquid-hydrogen target of the SVD-2 setup with a beam of 50-GeV protons are presented. A simulation of the detection of photons from the decay of neutral pions with the aid of an electromagnetic calorimeter revealed a linear relation between the number of detected photons and the mean number of neutral pions in an event. After the introduction of corrections for the loss of charged tracks because of a limited acceptance of the setup, trigger operation, and the efficiency of the data-treatment system, distributions of the number of neutral pions, N 0, were obtained for each value of the total number of particles in an event, N tot = N ch + N 0. The fluctuation parameter ω = D/〈N 0〉 was measured. 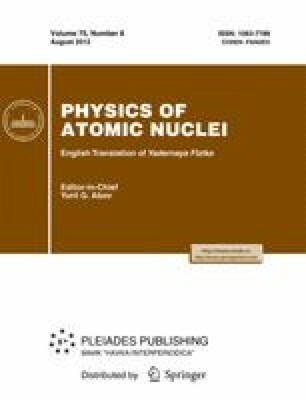 In the region N tot > 22, fluctuations of the number of neutral pions increase, which, within statistical models (GCE, CE, MCE), indicates that the system involving a large number of pions approaches the pion-condensate state. This effect was observed for the first time. Original Russian Text © V.N. Ryadovikov, 2012, published in Yadernaya Fizika, 2012, Vol. 75, No. 8, pp. 1050–1059. A. G. Afonin, A. N. Aleev, E. N. Ardashev, V. V. Avdeichikov, V. P. Balandin, S. G. Basiladze, M. A. Batouritski, S. F. Berezhnev, G. A. Bogdanova, M. Yu. Bogolyubsky, V. A. Budilov, Yu. T. Burzunov, Yu. A. Chentsov, G. G. Ermakov, P. F. Ermolov†, N. F. Furmanets, V. F. Golovkin, S. N. Golovnya, S. A. Gorokhov, N. I. Grishin, Ya. V. Grishkevich, D. E. Karmanov, A. V. Karpov, G. D. Kekelidze, A. G. Kholodenko, V. I. Kireev, A. A. Kiryakov, E. S. Kokoulina, V. V. Konstantinov, V. N. Kramarenko, A. V. Kubarovsky, L. L. Kurchaninov, A. Ya. Kutov, N. A. Kuzmin, G. I. Lanschikov, A. K. Leflat, I. S. Lobanov, E. V. Lobanova, S. I. Lyutov, V. N. Lysan, M. M. Merkin, G. Ya. Mitrofanov, V. V. Myalkovskiy, V. A. Nikitin, V. D. Peshehonov, V. S. Petrov, Yu. P. Petukhov, A. V. Pleskach, M. K. Polkovnikov, V. V. Popov, V. N. Ronzhin, I. A. Rufanov, V. A. Senko, N. A. Shalanda, M. M. Soldatov, V. I. Spiryakin, A. V. Terletskiy, L. A. Tikhonova, Yu. P.Tsyupa,A.M.Vishnevskaya, V. Yu.Volkov, A. P.Vorobiev, A. G. Voronin,V. I. Yakimchuk, A. I. Yukaev,V.N. Zapolskii, N. K. Zhidkov, S. A. Zotkin, and E. G. Zverev.